One of Australia’s top neurosurgeons is at the forefront of a world-first trial testing whether medical cannabis could be used to treat aggressive brain cancer. 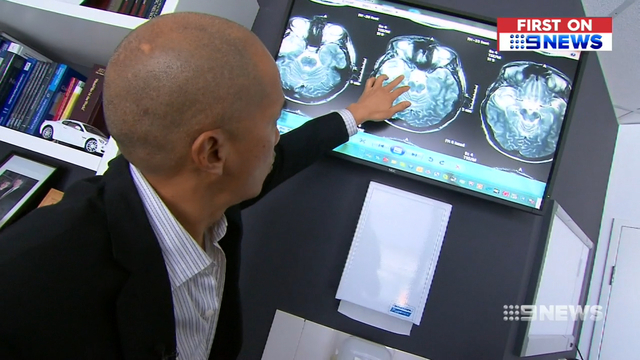 Professor Charlie Teo and nutritional supplement company BioCeuticals are leading the clinical trial, which is examining if the plant-based tonic can ease symptoms and maybe even slow cancer growth in sufferers of Glioblastoma, or GBM. Eighty two Australians aged between 19 and 70 with GBM are participating, taking a daily oral dose of cannabis containing high THC (Tetra Hydro Cannabinols) . “The product that we are using in the trial is an organic, whole plant extract which is taken orally as an oil,” Belinda Reynolds from BioCeuticals told 9News. Brain scans throughout the three month study will also be examined to see if there's any impact on tumour growth. “One of the main improvements that we're hoping to see is reduction in that nausea so they feel less ill and also an improvement in appetite which can ultimately help with reducing that weight loss,” Ms Reynolds said. “To be a realistic we are looking at a treatment that may offer people some benefit,” Prof Teo added. Patients must continue their conventional treatment throughout the trial. The experts involved are not promising a cure but said they want to put some science behind the use of medicinal cannabis, and offer patients some relief from this devastating disease. About 1000 Australians are diagnosed with GBM each year, with treatment options limited to surgery, chemo and radiation therapy. “It is the most aggressive of all cancers known to mankind and has a terrible prognosis,” Prof Teo said.